Turkish-Kurdish lasting peace, in sight? The Turkish government started peace negotiations with the jailed PKK leader, Abdullah Ocalan in late December, 2012. Inflated debate amongst the Turkish public focused on whether the PKK could be disarmed and demobilized; whether Ocalan would be released and what would be the status of the PKK militants? While nationalist parties and journalists criticized the AKP government for its initiative, the silence of civil society overall together with the major political forces testified to people wanting peace. Yet, what promises are held out by the Imrali process and what problems might still prevent a lasting peace? The Imrali process promises to resolve not only an identity-based conflict but also the Kurdish insurgency. The crux of the matter is how Kurdish identity will be acknowledged by the Turkish state, how this will be reflected in Turkey’s Constitution and what guarantees will be given to the Kurdish people in terms of governance, cultural and language rights. And how is this going to be done? The main problem here is that many people including top Kurdish and Turkish politicians see the negotiations as a bargaining opportunity rather than a process. However, both Abdullah Ocalan’s and well-informed AKP members’ statements demonstrate that both parties have taken their lessons to heart after the failed Oslo negotiations in 2011. It is important to view the negotiations as a process because lasting peace requires well-grounded agreements alongside the disarmament, demobilization and reintegration process. Given the fact that both Turks and Kurds invoke South African and Northern Ireland peace processes as examples for Turkey, I will argue that the negotiations are not an end in itself: rather, the beginning of a broader peace process that might take years to establish. As recent clashes in Northern Ireland and South Africa show, legal and political frameworks might not be enough. A meta-approach including political, legal, social and economic variables might ultimately be needed to achieve a just and sustainable peace. So what are the immediate obstacles to be overcome? First, communication problems among Kurdish stakeholders. The Kurdish Peace and Democracy Party members rarely talk to Ocalan since nobody can visit him without the permission of the Ministry of Justice. There are also the Qandil and European wings of the PKK. Without coordinated communication between these players and their consent, the peace process could be derailed. Second, parties did not announce a ceasefire. Taking the advantage of an implicit ceasefire due to the weather conditions might not be as productive as parties calculate. Two months later, both the PKK and the Turkish security forces will resume their operations as the snow melts. Recall the Silvan attacks of the PKK in which 13 Turkish soldiers were killed. It divided the Turkish nation and brought an end to the Oslo negotiations. For now, let’s hope negotiations lead to an initial ceasefire so that we do not make the same mistakes. Third, nationalist statements from both the Prime Minister Erdogan and Kurdish leaders might harm the process. Prime Minister Erdogan rejects Kurdish nationalism and continues security operations against the Kurdish insurgency including PKK’s urban structure, the KCK. 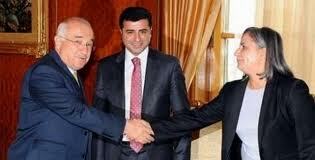 Selahattin Demirtas, the leader of the Peace and Democracy Party meanwhile employs an intermittently hostile stance. While these quarrels might be considered as tactics for the negotiation process, it actually means that neither the Turkish government nor some Kurdish elites have moved from their nationalist positions. Fourth, civil society is neither included in the negotiation process nor properly informed about its developments. Further, the government has not initiated a bottom-up process to promote societal peace. Projects that bring together community and religious leaders as well as ordinary people might help them to understand each other and what peace means for Turkey. It is no secret that there is a wide divide between young Turkish and Kurdish people. Projects and programmes targeting the wider populace will be essential in building trust, understanding and support for the peace process. Despite all these problems, it seems there has been some progress. The late Kurdish politician Serafettin Elci once said that this generation is the last Kurdish generation that has a chance to achieve peace. Let’s hope peace prevails this time and both Kurdish and Turkish people enjoy freedom, democracy, justice and prosperity together.